BLUES & ROOTS MASTER STACY MITCHHART returns to Barnegie Hall!!! Stacy brings power and joyful energy to his live performances. His original songwriting, playful delivery, and roadhouse virtuosity have won him an international following and made him the ambassador of the Music City blues scene. $20 donation requested. JUST US is our house band. You’ll hear good harmonies and songs with great melodies from some of your favorites music groups. Songs from Steely Dan, the Eagles, the Beatles, the Byrds, the Doobie Brothers, the Beach Boys, and more! They always donate their performance to the cause so every penny goes to support Music on a Mission. $15 donation requested. A tribute to Fleetwood Mac returns to Barnegie Hall! They will take you on a three decade journey through the best dance era of our lifetime. NO MORE SEATS AVAILABLE. Enjoy listening and dancing to your favorite songs with this high energy, rock n' roll band! Come to dance!! Any donation is welcome. TODD SHARP toured for several years as the guitarist for Hall and Oates in the mid-1970s. He went on to tour with Rod Stewart, Mick Fleetwood, Carlene Carter, Randy Meisner, Richard Marx, Bob Welch, Delbert McClinton, & French legend Eddy Mitchell. He’s worked alongside Bonnie Raitt, Eric Clapton, David Crosby, Steve Winwood, Eric Carmen, and more. Todd’s songwriting achievements include co-writing the top 10 hit “Got a Hold on Me” with Christine McVie, Juice Newton’s “ A Little Love”, along with other notable covers by McVie, Mick Fleetwood, Bob Welch, Jeff Healey, and more. JACK BRUNO, drummer, has worked with Tina Turner since 1981. He has toured and recorded with many other artists including Richard Marx, Billy & the Beaters, Peter Frampton, Elton John, Joe Cocker, Taj Mahl, & Delbert McClinton. Jack is still recording, touring and playing concerts worldwide. MIKE JOYCE, Bass player for 35 years in Nashville playing on records and gigs for Roy Orbison, Roger Miller, Jimmy Hall, Gene Cotton, Rosanne Cash, Gail Davies, Joel Sonnier, Flaco, Jerry Lee Lewis, Harlon Howard, Max D. Barnes, just to name a few. Song writer for my own publishing company with cuts by Tricia Yearwood, The Kinleys, Gail Davies, Charley Majors(Canada). He now plays & tours with Delbert McClinton. PAT BUCHANAN- guitar player who toured with Hall & Oates and Cyndi Lauper. As a session musician, he recorded with many artists, including Rodney Crowell, Dixie Chicks , Faith Hill ,Kenny Chesney , Don Henley, Dolly Parton, and Amy Grant. He also recorded on film and television soundtracks, including the ‘Nashvill’e television series. Buchanan won the Academy of Country Music award for Guitarist of the Year in 2005. $20 donation requested. International recording artist and singer songwriter, Jesse Terry, returns. He'll do some songs by himself and some backed by his favorite cadre of local musicians - our own "Barn Jovi." His voice has been compared with Jackson Browne and James Taylor. $15 donation requested. Rachel has opened for many top artists including Emmylou Harris, Willie Nelson, Merle Haggard, Peter Cooper & Eric Brace, Nathan Bell, Mary Chapin Carpenter, Bill Kirchen, Chuck Mead, Phil Lee, Loretta Lynn, Ray Stevens, Toby Keith, Brad Paisley, Vern Gosdin, Clint Black , Alan Jackson, Aaron Tippin, Bill Monroe, Ralph Stanley,Richie Furay, Donna the Buffalo, The Carpenter Ants, Little Jimmy Dickens, Southern Pacific, Ricky Scaggs, David Jacobs Strain and The Judds. Rachel is also a music teacher for the Elyria City School District. $15 donation requested. Rebecca Dawkins and Tim O’Donnell intertwine blues and country. O’Donnell’s whiskey-tinged vocals are a perfect match for Rebecca Dawkins’ glorious harmonies and soaring fiddling; the two of them can sound as charming as an old-school country duet like Parton and Wagoner, or as bittersweet as that old recording of Townes Van Zandt and Emmylou Harris. It’s roots and roll that rocks! $15 donation requested. DREW AND CLAUDIA DOMAN & FRIENDS will celebrate the 50th anniversary by recreating some of the music of the performers at Woodstock back in 1969. Prepare for memories!! JUST US will do a CSNY set. $15 donation requested. This high energy, eleven (11) piece band crosses all genres of music. The band highlights the lead singers, Charlie Sanchez (formerly with the Upfront Band) and Vanessa Arocho, while powered by a soulful, three-piece horn section which includes, Tony Delgado, Gary Stursa and Tony Rosario. The three highly acclaimed percussionist are Louie Morales, Cecil Rodriguez and Chaco Serrano. Dominic Cataldo performs on keyboards and flute. Hichem Ferrah is on lead and rhythm guitar. The musical director and bass player is Elmer Arocho. From Smooth Jazz to Cuban Timba, then to Funk, or Motown, they are the ultimate cross over band. $15 donation requested. They play what they grew up with-- songs from the 50’s and 60’s. They play songs from The Kinks, Animals, Carl Perkins, Yardbirds, Johnny Otis, Zombies, Byrds, Sonics, and more! Primitive Rock and Roll for the “now” generation. $15 donation requested. From the hills of Appalachia, The Kevin Prater Band brings that Pure Kentucky Sound. The Kevin Prater Band bases their sound on strong vocal harmonies, built around high trios, and their style is reminiscent of the classic Seldom Scene and 1970's Country Gentlemen performances. They are also steeped in the tradition of Gospel music, and pride themselves on the a capella hymns and great gospel songs that people have come to enjoy. The band includes classic country in their repertoire and loves bringing old familiar favorites to life. Add a little vintage rock and roll and you never know what else you might experience at a KPB show! $15 donation requested. The songwriters from our DREW program will perform the songs that have been written in our second year of workshops. $15 donation requested. Veterans are our guests! Time Traveller, 4 decades of music by the Moody Blues. The Moody Blues originated the Rock/Orchestra experience. Time Traveller performs at festivals, theaters, concert venues, and corporate events throughout America and has opened for Kansas, Poco, Blue Oyster Cult, Pure Prairie League, to name a few. Time Traveller has been simulcast on radio and television. Every song they do is to a high level of perfection and energy. The talented No Name Band of attorneys and judges out of Cuyahoga County bring their singers, horn, and rhythm sections to provide music to dance to or sit back and enjoy. They will rock the place for a fun filled early evening event you won't want to miss. Hear our songwriter & veteran pairs talk about the process of writing a song about their military experience, and then hear the songs come to life! Avon Lake High School Auditorium: 175 Avon Belden Rd., Avon Lake. $25/ticket. No charge for veterans. A widely respected songwriter in many genres, James has spent over two decades writing songs that have been honored with Grammys, Country Music Association and Academy Country Music Awards, and countless other Billboard Chart Toppers and finally, three songs collectively surpassed the BMI Certified Radio Spin 5 Million mark. His latest success has carried over from Music Row to Beale Street by working with guitar-slinger Joe Bonamassa, Britain’s Joanne Shaw Taylor and the powerhouse voice of Beth Hart. His songs always have a soul and blues undertone. As a singer, James’ voice has that rough soul that is his secret weapon as a writer and performer. As a guitar player, he lets his Fender Strat do the talking. $20 donation requested. Enjoy the sounds of JUST US after a delicious clambake provided by Pogie's Catering. $35 for the clambake. Extra dozen clams: $8.50. Bakes must be ordered/paid for by Sept. 28. Dinner at 4:00. This six piece group led by Brent Kirby performs the music of Gram Parsons. By fusing the timeless twang of country and the youthful energy of rock 'n' roll, this cult hero blazed a trail for the likes of the Eagles and any number of other so-called "country-rock" artists. Parsons himself preferred the term "cosmic American music" to describe his sound. $15 donation requested. PROGNATION is one of the most talked-about classic prog-rock acts, demonstrating first-class performances of YES, King Crimson, Genesis, ELP, Moody Blues, and more all in one band! ProgNation is a huge hit with classic progressive rock fans old and new at concerts, festivals, and special events. DEREK DEPRATOR opens. $15 donation requested. 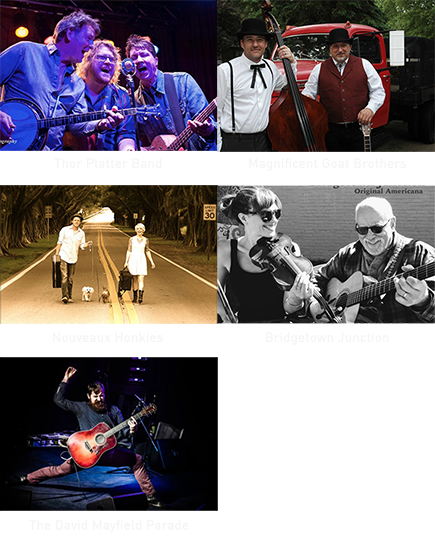 1:00-5:00: Zizzling Hot Americana / Roots groups come rambling through Ohio up to our door step at Barnegie Hall. You will want to reserve seats early as this should be a sell-out. With the help of promoter Ron Silverman, the line-up will include Bridgetown Junction (Honeybucket History), Magnificent Goat Brothers (Magical Theatre), Nouveaux Honkies (sweet pickers up from Florida), Thor Platter Band (on the country charts), and concluding with Nashville recording artists, The David Mayfield Parade (Bonnaroo, Avett Brothers, Mumford & Sons). Five toe-tapping, foot-stomping groups! CLAY EVANS, CONNOR NASH, & MICKEY KELLEY are each talented in their own right and could do a solo show. Having the three together is three times more fun. Good voices, strong material and entertaining personalities, you will feel like you have a front row seat at the Bluebird Café in Nashville. $15 donation requested. GRINGO STEW serves up authentic American music, with a touch of southwestern spice. These six musicians individually honed their craft on the beer-soaked stages of Austin and San Antonio, in the smokey bar rooms and concert clubs of Cleveland, Detroit, Boston and Nashville, and in sweaty barns and dance halls throughout the midwest. Whether performing their unique, or reverant, renditions of lesser-known works by great American masters, or their own lively and engaging originals, the musicians in GRINGO STEW insist on one critical ingredient: authenticity. Songs about real life and honest emotions. A chunky, hearty rhythm supplied by bassist Johnny "Mac" McIlwaine and drummer Tom Getz; a dollop of creamy fiddle from Jim Kelly; an infusion of Michael Rendon's savory Texas vocals; topped off with the "5-alarm" smoking guitar of Frank Scialdone; and garnished with spicy harmonies: that's the GRINGO STEW recipe! THE DIAMOND PROJECT BAND is dedicated to performing a true replication of the musical styling of a live Neil Diamond concert. Rather than give the audience a straight studio version of Neil's classics, they strive to incorporate the excitement, energy and musicianship that only a live show can provide. THANK YOU TOM & TOMIE PATTON FOR SPONSORING THIS SHOW!! April 8, 4:00: HILLBILLY IDOL has been delighting audiences for over two decades with a mix of Classic American Roots Country music. From ballads to banjo, Honky-tonk to harmony, bluesy fiddle to sweeping steel guitar, this band has it all. Enjoy their show, Grand OH Opry Revue, as they pay tribute to their own heroes of Country music, while mixing in traditional and original songs as well. “Not everyone was lucky enough to have been raised within earshot of the Grand Ole Opry. Our job is to make them wish they had.” -Paul Kovac $15 donation requested. JAMES KILBANE is an internationally known, multi-platinum selling, Irish singer. James Kilbane was the runner up in Ireland's national talent television show You're A Star in 2004. Opening for him is NO STRANGERS HERE, a fun, interactive Irish folk band. NO MORE SEATS AVAILABLE. TOM PETTY/GLENN FREY TRIBUTE-SOLD OUT!! DREW DOMAN & Friends play all your favorite Tom Petty songs, along with tributes to others who died recently including Prince, David Bowie, Walter Becker (Steely Dan), George Michael, and more! JUST US will bring back Glenn Frey and the Eagles music. NO MORE SEATS AVAILABLE. Some of Cleveland’s best play together. It is an experience!! Jackie Warren, Joe Hunter, George Foley, Doug McCutcheon, with Gerry Parisi on drums. $15 donation requested. JUST US is opening! MUSIC ON A MISSION ANNIVERSARY! Help us celebrate 10 years of service with Just Us and the Music on a Mission Band! Joyful Voices Choir performs first!! Complimentary line dance lesson in between bands. $15 donation requested. Liv Miraldi comes home bringing two of her very talented songwriter friends Phil Barnes and Brad Blackburn from Nashville to join her for a songwriters' round. The three will take turns singing their original songs. Liv has been performing in venues in Nashville and Los Angeles and was recently the featured vocalist on EDM producer Ken Loi's track "Hollow." Liv just released a new single "Undertow". Touring since 2010, Phil Barnes has done over 900 shows and opened for headliners Nick Jonas, Kelly Clarkson, Jessie J and We the Kings. Texas native Brad Blackburn meanwhile has been burnishing his own reputation since moving to Nashville by winning 8 songwriting contests including the 2015 ASCAP Bart Howard Songwriting Award and the 2016 ASCAP Leon Brettler Award. His performances include playing in the CMA Fest, Belmont University’s Best of the Best Showcase (3 years in a row), the 18th and 19th Annual Grammy Block Party, the 2016 ASCAP Foundation Awards at the Lincoln Center and the Live Wholly Festival. $10 donation requested. Don Schlitz is one of only three inductees into the 2017 class of the Country Music Hall of Fame, from his usual perch on stage at sold out concerts at the Bluebird Cafe. Don Schlitz’s first recorded song, The Gambler, sung by Kenny Rogers, won him the 1978 Grammy for Country Song of The Year. Randy Travis’ Forever and Ever, Amen earned him the same award in 1988. Don’s won three CMA Song of the Year Awards and two ACM Song of Year Awards. His songbook includes 24 #1’s and such Country standards as On The Other Hand, I Feel Lucky, Houston Solution, One Promise Too Late, He Thinks He’ll Keep Her, 40 Hour Week (for a Livin’), Rockin’ With the Rhythm of the Rain, When You Say Nothing At All, Deeper than the Holler, Learning to Live Again, and Strong Enough to Bend, songs sung by Reba, Garth Brooks, Keith Whitley, Alison Krauss, Mary Chapin Carpenter, Tanya Tucker, The Judds and many others. In 2001 he wrote the songs for the Broadway show, The Adventures of Tom Sawyer. This four-time ASCAP Country Songwriter of the Year was inducted into the Nashville Songwriters Hall of Fame in 1993, and the North Carolina Music Hall of Fame in 2010. Schlitz received the ASCAP Creative Achievement Award in 2007 and in 2010 was honored with the Academy of Country Music’s Poet’s Award for lifetime achievement in songwriting. $20 donation is requested. #1 hit songwriter, two time Grammy winning producer, recording artist, world traveling performer, and session guitarist!! In 2006 he was nominated to the Nashville Songwriter’s Hall of Fame, in 2011 he was inducted into the Texas Songwriter’s Hall of Fame. There are over five hundred recordings of his songs in various genres including country, rock, blues, folk, bluegrass, and pop by such diverse artists as BB King, Garth Brooks, Bonnie Raitt, George Strait, Fleetwood Mac, Willie Nelson, Vince Gill, Etta James, John Prine, Dixie Chicks, Don Williams, Stevie Nicks, Buddy Guy, Emmylou Harris, Keb Mo, Ringo Starr, George Jones, The Neville Brothers, Reba McEntire, Robert Plant, Waylon Jennings, Patty Loveless, Kenny Chesney, Guy Clark and the list goes on. In addition to his Grammy winning records with Delbert McClinton, who has recorded over fifty of his songs, he has produced records for The Judds, Wynonna, Pam Tillis, Billy Joe Shaver, T Graham Brown, Chris Knight, Taylor Hicks, Seth Walker and others. His work has been included in many major motion pictures and television, the song “Falling and Flying “ is featured in the Oscar winning film “Crazy Heart” performed by Jeff Bridges. ”Peace Dream” recorded by Ringo Starr was co-written by Gary, Ringo, and Gary Wright and features Paul McCartney on bass. Current songwriting credits include a song on the recent Grammy winning release by Bonnie Raitt, another co-written song with Ringo Starr for his new cd, and new recordings by George Strait, Dierks Bentley, The Mavericks, and a BB King/Buddy Guy duet. $20 donation requested. Band members: MIKE JOYCE, DENNIS WAGE, LYNN WILLIAMS. THANK YOU DAN HOPKINS FOR SPONSORING THIS SHOW!! Clarence Darrow examines Darrow’s life, his impact on our judicial system and his quest to tackle issues of social justice. This evening of living history provides the audience with an opportunity to examine the growth of our nation and to contrast the social issues of our past as they relate to our modern day struggles. Historical, thought provoking and entertaining, the play will appeal to not only members of the legal profession but anyone interested in our history and the fight for workers’ rights, civil rights, equality and social justice. Kevin D. McGee is a Cleveland native and a NYC based actor whose recent TV and Film credits included ShowTime’s Billions, HBO’s The Deuce, Gotham, Little Men, Hello Again, Bull, The Good Wife, The Good Fight, Grave Secrets, I Did Not Come Here to Make Love, The Anti-Love Story, A Crime to Remember and The Perfect Murder. $15 donation requested. Barnegie Hall is proud to present singer-songwriter Mollie Greenspan and Emmy nominated composer, songwriter and producer Philip Giffin. Giffin & Greenspan are in the Ohio area to showcase their debut album that Phil produced. With Mollie on lead vocals and the backing vocals of professional LA studio singer Karen Blake (Phil's talented wife) and Hilary James-DiSimone (daughter of the legendary Bob James) along with Northeastern Ohio's session musicians Dave Marchione (on guitar) and Kip Reed (on bass), Phil will share his latest arrangements and orchestrations to songs that he and Mollie co-wrote together. It's a beautiful blend of pop, rock, jazz & even folk music, as if Nora Jones, Adel, Amy Winehouse & Joni Mitchell were all wrapped into one. Suggested donation $15. Born out of the woods of Montclair, NJ and the rolling plains of Oberlin, OH, Sammy Trombone is not your everyday band. In Sammy Trombone, Sammy Mellman uses his trombone, his looper, and his harmonic intuition to weave together arrangements of both original tunes and his favorites from Bon Iver, Phox, Indigo Girls, and more. With every composition, he serenely loops until both he and the audience feel the whole become more than a sum of its parts. Saxophone, bass and drums complete the quartet, giving the trombone and vocal loops that deeper groove to bop your head to. Yet, Sammy's trombone and voice are more than enough to share a transcendental message through his music. HICHEM FERRA will open with his amazing guitar. $10 donation requested. Our house (Barn) band performs songs that often are not covered, but are familiar to those who grew up in the 60's and 70's. Songs with lots of good melody and harmony from the Beatles, the Eagles, Crosby Stills and Nash, Bonnie Raitt, Steely Dan, and more. $15 donation requested. WE HAVE NO MORE SEATS AVAILABLE. They combine country, blues, soul, and rock & roll as if there were no distinction.. The result is what band founders (and brothers) Paul and Bill Kraker call "Feel Good Music". According to Paul, “Guys like us fall through the cracks. Too country for rock, too rock for blues and too blues for country". $15 donation requested. LONG ROAD plays intricate arrangements, using various combinations of nearly 20 instruments, including guitars, acoustic bass, banjo, mandolin, ukulele, autoharp, Celtic harp, fiddle, pedal steel guitar, hammered dulcimer and bowed psaltry, and six voices. Specializing in 1960s acoustic singer-songwriter fare, Long Road calls itself “Cleveland’s favorite – and only – '60s-style folk group.” The group’s motto is “Making Old Songs New and New Songs Sound Old” because it performs not only '60s folk, but traditional folk, and folk-y versions of early-'50s rockabilly, late-'60s psychedelic rock, '20s and '30s jazz and jug-band music, early and contemporary country, '60s folk-rock, blues, bluegrass, contemporary folk and pop, and a few originals – but all in a '60s folk style. $15 donation requested. This six member band faithfully re-creates an authentic SANTANA concert. Evil Ways covers every era in SANTANA’s incredible 40+ years as an entertainer. Evil Ways performs classic songs from Woodstock like Soul Sacrifice and Black Magic Woman, on up to the grammy- winning album Supernatural and beyond. Stunning instrumentals, high energy drumming and percussion, and of course the legendary sound of the guitar, all come together. $15 donation requested. Singer/songwriter CRAIG CAROTHERS returns with DON HENRY for an evening of well-crafted tunes and stories. Craig Carothers is a singer/songwriter from Portland, OR, now making his home in Nashville, TN. He‘s recorded and released ten albums in the last twenty years. His songs have gone "Gold" and have been recorded by Trisha Yearwood, Kathy Mattea, and Peter, Paul, and Mary, just to name just a few. Don Henry's credentials are extensive. He is a Grammy award winning songwriter with songs recorded by legends like Ray Charles, Patti Page and Conway Twitty, Gene Watson, John Conlee, BJ Thomas, Blake Shelton, Lonestar and Miranda Lambert. $15 donation requested.